A win for the red team. 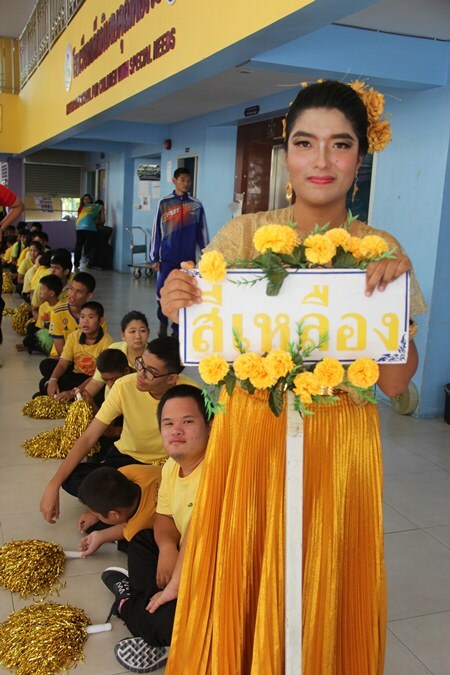 At the beginning of the current school year, the Ministry of Education upgraded the Father Ray Special Needs Center to school status. 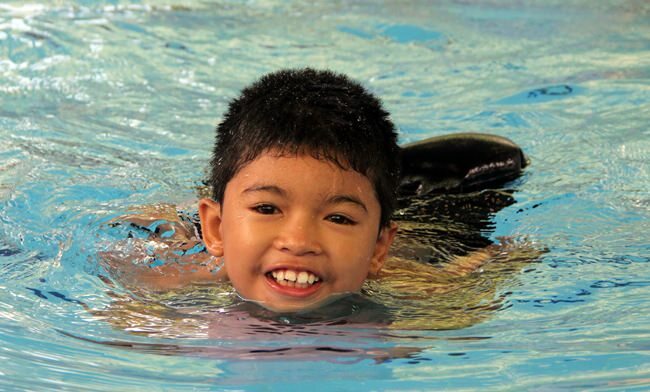 This upgrade is due to the high quality of care and education it offers to children with special needs. 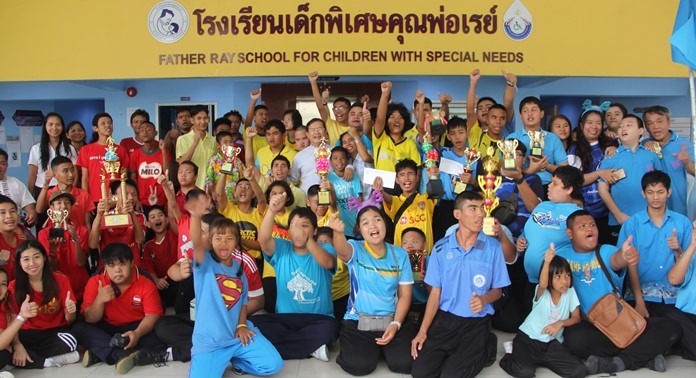 The Father Ray School for Children with Special Needs has six grades, 1-6, and each year another grade will be added so the students will have the opportunity to complete the compulsory nine years of schooling. 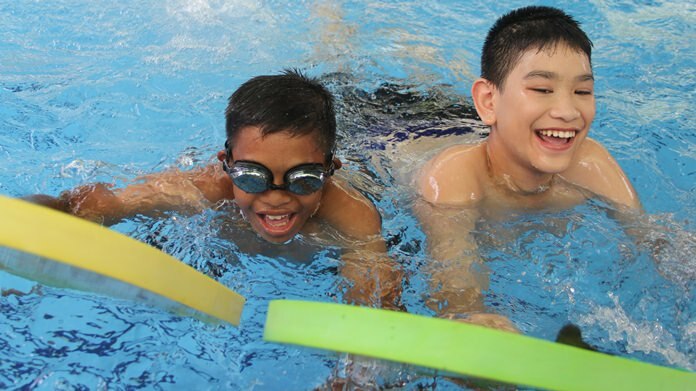 There are also pre-vocational and vocational training courses, and today the school is attended by approximately one hundred and fifty children and teenagers who are living with autism, ADHD, Down syndrome, cerebral palsy, physical disabilities and a whole range of learning disabilities. 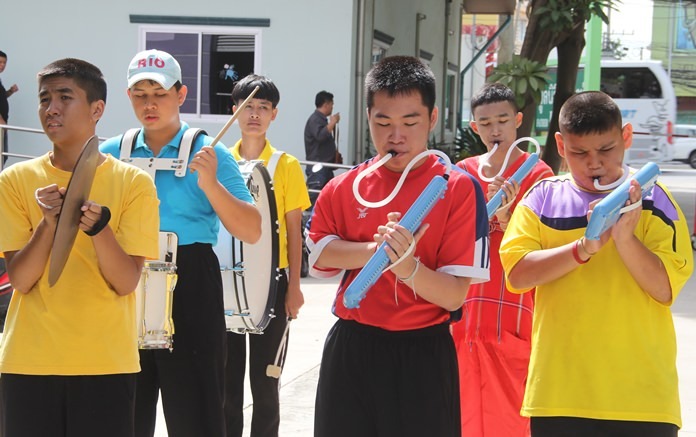 As with any school there has to be an annual sports day, and the inaugural competition took place recently with the children divided into either the yellow, red or blue teams. 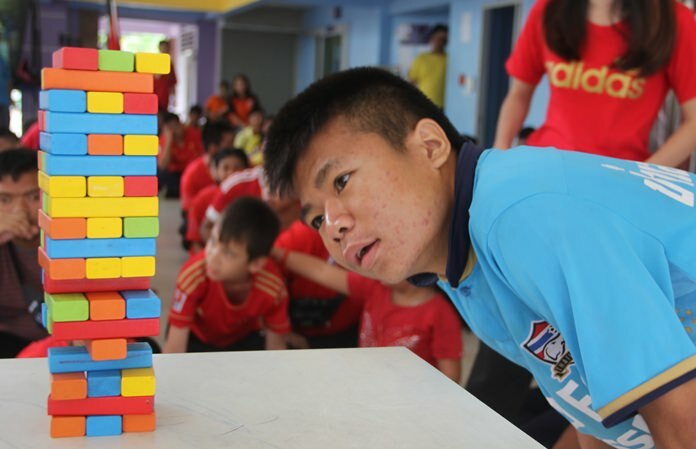 The two day event started with a parade of the athletes and sports included athletics, swimming, volleyball, badminton, tug-of-war, petanque and jenga. From the pool, with love! Jenga is not a game that is usually seen at major sporting events, but for a child with special needs it takes a lot of concentration and they need to use both their mental and fine motor skills; unfortunately for one little boy who knocked down all the bricks he thought he had won and no one had the heart to tell him he had actually lost the game. Every single student took part in at least one event, for most the first time ever taking part in a race or a competition. 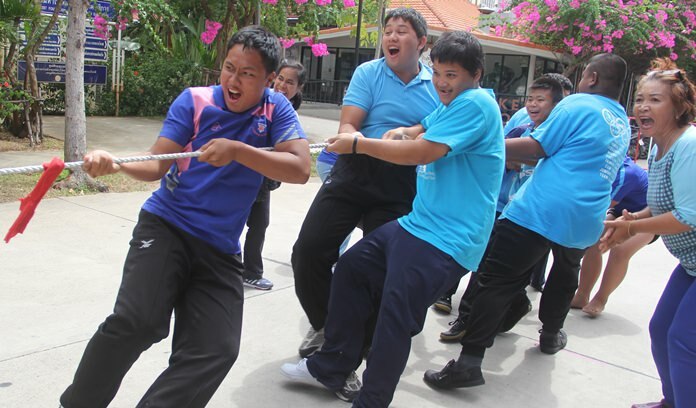 The tug-of-war event saw most injuries, with several of the larger boys falling on top of their younger, smaller and skinnier team mates, but no lasting damage. When the winning team was announced they received as much cheering as the team in second and third place. 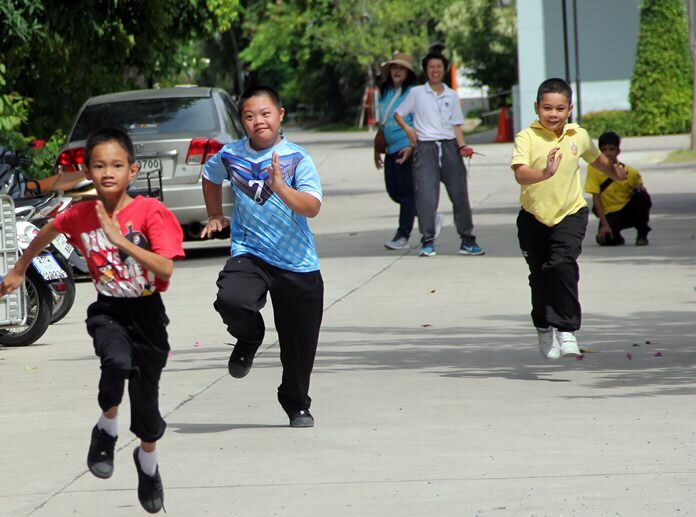 For these children just taking part makes them all winners. It doesn’t really matter who won, they were having fun. Without this school most of these children would have nowhere to go. Local schools won’t accept children with special needs, and the majority of parents don’t want to send their children to a boarding school many miles away. Today they have a purpose in life, a reason to get up each morning, but just as important is that they are being educated and they have friends. 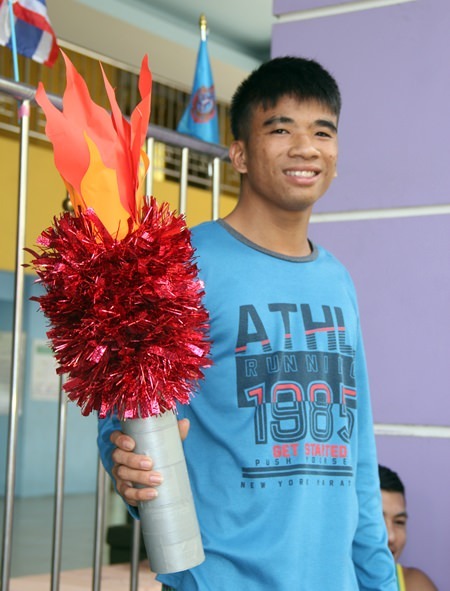 The flame bearer, who will soon represent Thailand at the Special Olympics. Jenga, a game a patience and skill. Winner of the swimming the width. Motherly support in the tug-of-war. The blue team also won several trophies. 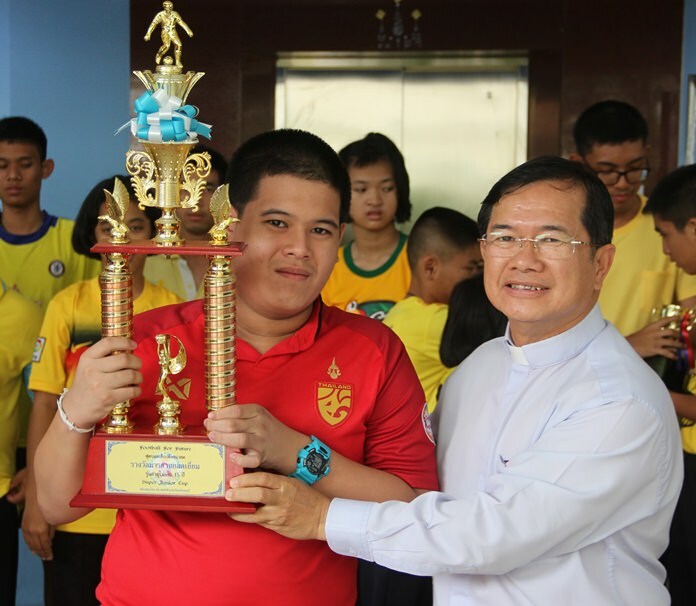 Father Michael presents the winning trophy to the red team.